. Ganshu Fudo 眼守不動　Fudo Myo-O Protector of Eyes .
. Kakinomoto Hitomaro 柿本人麻呂 Hitomaru 人丸 / 人麿 .
. Taira no Kagekiyo 平景清 .
. 新井山 Araisan　梅照院 Baisho-In 薬王寺 Yakuo-Ji .
. Yakushi Nyorai, the Buddha of Medicine 薬師如来 . 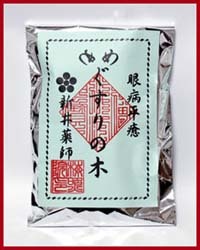 The Tendai school played a key role in spreading the still-popular belief that Yakushi is adept at curing eye ailments. The story originated in the Nanbokuchō period (1336–92) and involves the Tendai monk Seigan 清眼僧都 (d. 1379) and his eye clinic at the Tendai temple Myōgen-in 明眼院, Aichi Prefecture. According to legend, Yakushi appeared to Seigan in a dream and promised to reveal the secrets of healing eyes. The next morning, Seigan discovered the medical text Kanbō-igaku 漢方医学 in the temple that enabled him to successfully treat people suffering from eye afflictions. Seigan's book contributed greatly to the development of ophthalmology in Japan in later centuries. houses more than 8,000 miniature statues of Yakushi. Devotees come here to pray for relief from eye problems and other ailments. 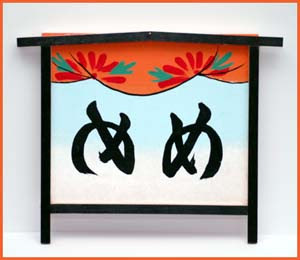 There are many ema votiv tablets under the tree and a large flag with eyes.
. Hitachibo Kaison Sennin 常陸坊海尊仙人 . 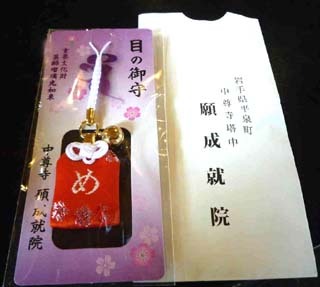 Kaison is venerated at Aoso Jinja as a deity to heal eye diseases 眼病の神.
. Kiyomizu Sha 清水社 Kiyomizu Shrine . There was once a samurai with an eye disease. When he washed his eyes with this spring water, he got healed soon. ME no kami　目 means eyes. o shimizu お清水 sacred clear water to heal eye diseases.
. Senjuji Tokonagesan 獨鈷抛山千手寺 Mount Tokonage-San, Senju-Ji . 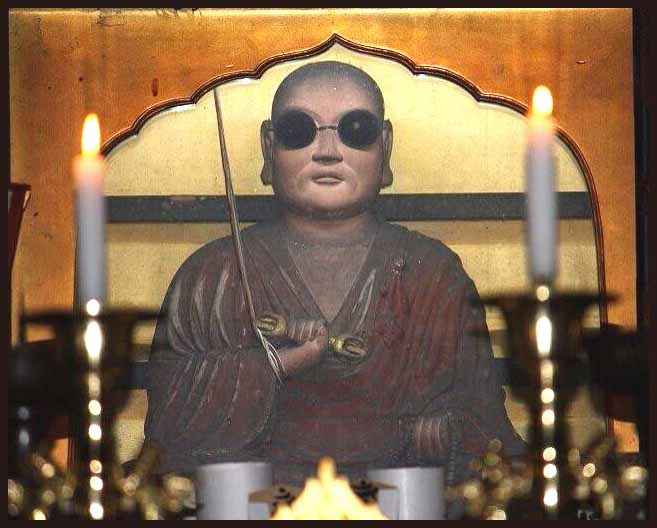 Kannon Bosatsu shot with one arrow in her eye !
. Yookoku-Ji 楊谷寺 Yokoku-Ji .
.　Joofukuji 常福寺 Jofuku-Ji . 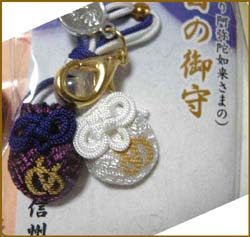 There is also a small sanctuary to cure diseases of the eyes.
. . . CLICK here for Photos of Yakushi ! Once someone passed by, became very tired and took a nap, but then realized there was a wildfire. When he tried to run away a crane pulled his leg and he fell. He hurt his eye on a udo plant (（独活、Aralia cordata）. So until our times people come here to pray to Yakushi to heal their eye diseases. 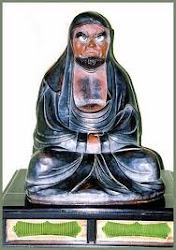 Yakushi Nyorai, the deity to whom the temple was sacred. He named the temple Byodoji (Equality Temple) because he endeavored to save everybody equally. Another legend tells that Kobodaishi once drove his cedar walking stick into the ground, and the stick turned into a giant cedar tree, which stands in the temple compound to our day. 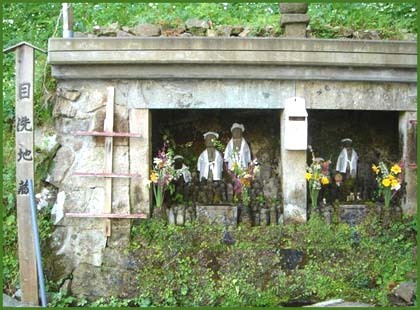 The well Kobo Daishi dug in the compound has a miraculous white water, that heals all diseases, especially the eyes. The name of the temple is also "White Water"
. 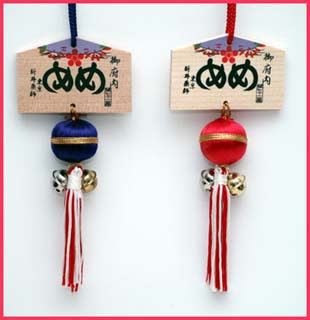 Kenkoo omamori 健康お守り for your general health . frog taking on your eye disease . 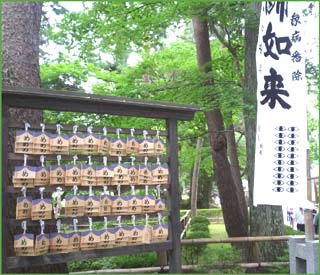 me-arai Jizoo 目洗い地蔵 "Jizo to wash your eyes"
at the Anju Jizo Hall 安寿地蔵堂　in Anamizu 穴水, Sado Island. Related to a novel by Mori Ogai (1862 - 1922). Anju and Zusio were sent to Tango (Kyoto), and their mother to Sado by swindler. On their way, Anju and Zusio managed to escape from him, but their mother was forced to work all days and finally she lost her eye sight. After a while, these two, who came to save their mother, were surprised how wide the island is, and decided to find mother separately. When Anju came to kanoura, she found her old mother was driving the birds away, singing “I miss my Anju, Hoyareho~, I want to see my Zusio, Hoyareho~”. So, she was running toward her mother saying “Mom, it’s me!! I have been longing to see you again ” However, the blind mother, who has been needled by neighbor kids, didn’t believe that’s real Anju, hit her out by stick and finally Anju died.. When she heard that’s Anju from her fellow later, she broke down and cried. And she decided to go to see Zusio in Aikawa with the fellow. And as soon as Zusio washed his mother’s eyes with the water welling up from earth nearby, her eye sight got back. Since then, this place/spot still remains the name “Tassha” and people built Jizo for them. Beside it is a wakimizu spring water with great healing power. The ladies of the village come here every day, splash water over the Jizo statue and pray for healthy eyes.
. meyami Jizoo　めやみ地蔵 Jizo to heal eye diseases　. Along the river Kamogawa in Kyoto, Jizo was there to stop the rain "ameyami Jizo" 雨やみ地蔵. ... An old women told a friend that her eyes had become weak and all medicines had failed, so she asked Enma for help. One day, as she was praying before the statue, he said to her, "I will gouge out one eye and give it to you." She looked up and saw that one of his eyes was gone, and blood was running from the empty socket. When she glanced around her, she realized that she could see everything clearly.
. Konnyaku Enma　蒟蒻閻魔, Emma, King of Hell .
. Kobo Daishi Kukai 弘法大師　空海 (774 - 835) . At Byodoji Temple, No 22 on the Shikoku Pilgrimage, they have special water that cures eye disease. The water is the same Kobo Daishi bathed in. Now I know where our next trip is going to be !! Good to hear of mending. Playing with mekazura　目鬘 "eye wigs" was also enjoyed by many people.